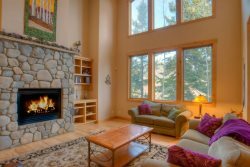 2 Bedroom Dillon Valley Retreat, Sleeps 4-6! Great little getaway in the mountains near Keystone and Lake Dillon! Dillon Valley East - Exterior View from building in Autumn - gorgeous Meeting spaces and guest lounge make it easy to host friends or entertain rowdy children. If you are eager to be in the center of all Summit County has to offer then staying in Dillon Valley is perfect for you! This 2 bedroom, 2 bath condo is located in the Dillon Valley East development and has 850 square feet on the garden level so you can walk right outside and play in the snow! Each bedroom is adjacent to their private bathroom so getting ready for the day is a breeze! After you park your car in the reserved spot outside, walk inside the main door of the condo you will take the stairs downstairs to a wonderful area to store your skis and snowboards without worry. As you enter the unit to the left is the first bedroom with 2 twin beds, in the living room is a Queen sofa sleeper and right off the living room is the master bedroom with a King bed. While the sofa sleeper is not in use the living room and kitchen flow into each other so while the chefs of the group are cooking a meal the rest of the group can have a conversation from the comfort of the couch. In the living room is also a television where you can catch up on latest t.v. shows or movies! The City Market grocery store down the road has a Red Box where you can rent d.v.ds for the night! While staying with us in Dillon Valley East you are free to use the clubhouse shared by the condos in the area. Here you will find a hot tub, pool, steam showers, sauna, ping pong and pool table as well as a washer and dryer. From the unit you are also walking distance to the local FREE shuttle service which can bring you to all the ski resorts in the area! Or you can bring your own car as your spot is guaranteed when you get home! Sleeping arrangements: (Master: King), (BR2 - 2 Twins), (Living Room - Queen sofa sleeper).